It could be the single most devastating event to happen to the U.S. sheep industry in recent history. Sheep and cattle rancher Patrick O'Toole, said U.S. Department of Labor rule changes, released in April of this year, are designed to eliminate the sheep industry. He and four others testified on that subject at a hearing hosted by Wyoming Republican Congresswoman Cynthia Lummis and Utah Republican Congressman Bob Bishop in Evanston, Wyoming, Aug. 6, 2015. The DOL rule requires that the legal, foreign herders and earn a significantly higher wage and make it much more difficult for ranchers to meet eligibility requirements to hire them, explained the livestock man whose family has operated on the Wyoming/Colorado border since 1881, far before grazing allotments were introduced. According to the American Sheep Industry, current H-2A herder pay rates vary by state, ranging from a minimum of $750 to $1,600 per month, not including free food, housing, clothing and all other supplies. The rule would more than triple most of these wages, to between $2,125 and $3,244 per month, in addition to free housing, food, clothing, supplies and transportation that will still be required. A University of Idaho study found that a typical, 1,000 ewe sheep outfit in that state that currently earns $60,000 per year will not be profitable, and will in fact lose $6,400 per year by adhering to the rule change. A University of Wyoming study concluded that ranchers that use herders would only be profitable 8 percent of the time, following the implementation of the rules. "I wish it wasn't that brutal," O'Toole said. And the loss of sheep ranchers affects more than just their families and employees. 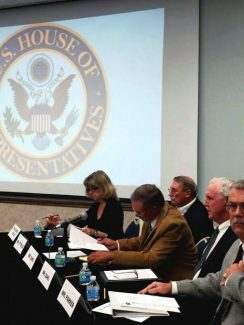 Sheep ranching helps sustain small towns throughout the west, said another panelist at the hearing, Evanston, Wyoming, rancher, Shaun Sims. In his written testimony he supplied evidence that, on average, every ewe in his state produces nearly $300 of economic impact. Ranchers and their employees need daily living needs – food, clothing, vehicle repair, etc. Additionally ranchers support a number of ag-related businesses, from trucking companies to machinery dealers. In 2014, sheep and lamb numbers in Wyoming totaled just over 350,000 head. Dr. Julie Shiflett of Juniper Consulting determined that 38 percent of the United States' sheep are raised on a ranch that utilizes herders, most of whom are legal, foreign workers accessed through the H-2A program. Ranchers say that domestic sheepherders are nearly impossible to find. The DOL's notice of proposed rulemaking stated that no more than 18 Americans held such jobs in 2014. While he cites several studies, and verifies their accuracy, O'Toole needs simply to look at his own checkbook to know that his ranch can't operate profitably under the DOL's rule changes. O'Toole met with U.S. Department of Agriculture undersecretaries and several congressional offices in Washington DC, last week on this very subject. USDA then held briefings with the DOL to advocate for the comments of the sheep industry including recommendations for a sustainable approach on the two key issues – wage determinations and eligibility of ranchers to hire workers, said American Sheep Industry executive director Peter Orwick. "A lot of livestock will disappear if this rule doesn't get changed," O'Toole said. For the 35 or more years that his ranch has utilized H-2A workers, some have remained with them for 18-20 years, going home to their native countries – often in South America – at least every 3 years for at least 3 months, O'Toole said. Orwick explained that some of the workers, after their 3-year visas have ended, return to their native Mexican or Peruvian homes and set up farms or ranches of their own. "They are often able to do that, with what they make here." Both cattle and sheep ranchers in his area utilize the workers, O'Toole said, but if someone thinks that sheep ranchers can just sell their sheep and replace them with cattle, reducing the need for herders, they had better think again. "It doesn't make economic sense. We've put generations of genetics together to produce sheep that fit well in our atmosphere and we rotate cattle and sheep based on a coordinated approach." Simply cutting sheep numbers and adding cattle doesn't pencil out and wouldn't be nearly as good for the landscape, he said. "We would lose a tremendous amount of the productive capacity of rural America," he said. Plus a massive selloff of western sheep would flood the market, dropping prices nationwide, he explained. At a time when the nation is making commitments to feed a growing world populous, and this country's integrated food supply is "the envy of the world," O'Toole questions the "death by a thousand cuts" that he and other ranchers believe come from federal agencies, including water rights challenges, land use restrictions and more. "The message is 'we are going to make it so difficult that you aren't going to produce food anymore,'" he said. Rep. Lummis, one of the meeting organizers, seems to agree. "Wyoming's livestock community faces threats to their livelihood on numerous fronts, and all signs lead back to Washington," said Lummis in a news release. "The people we heard from at the hearing are the people keeping our land healthy, productive, and sustainable for future generations. As a life-long rancher, I can tell you we don't just work the land, we love the land and we pour our souls into it. We have the most to lose when the Federal government makes unworkable rules that, however well intentioned, hurt the on-the-ground stewards of the natural resources we all care about. Congress needs to give these hardworking people relief from the federal regulatory barrage." Cheyenne, Wyoming, property rights attorney Karen Budd-Falen, another panelist is also concerned. 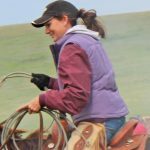 "I would argue that the biggest problem that not only the ranching industry in the West, but all of the agriculture industries across the nation, faces, is 'mission creep.' Mission creep is the expansion of a project or mission beyond its original goals. Mission creep is usually considered undesirable due to the dangerous path of each success breeding more ambitious attempts, only stopping when a final, often catastrophic, failure, occurs," she said in written testimony. She cited administrative policies that, without input from Congress or voters, are being used to manage federal land across the West with a heavy hand. The rules, O'Toole said, were designed by someone who realizes that if they will essentially eliminate sheep grazing in the West. "If it weren't so serious it would be funny. There is an agenda to control land by controlling labor." The DOL has no business getting involved in grazing issues, he added, saying that the definition of open range essentially checkmate grazing, and disqualify many sheep ranchers from being eligible to hire H-2A employees. O'Toole is emotional about the thought of losing employees who have become friends, and the herders aren't pleased either. "What they are saying – it's too personal. It's a tragedy for them. Why are these guys getting punished? What have they done wrong? They are planning for businesses when they retire, their kids are building homes." The DOL final rule is set to be published Nov. 1 with a Dec. 1. implementation date likely, Orwick said. But O'Toole returned home from the nation's capital optimistic that the true, raw, emotional stories shared by ranchers across the west will have a positive impact on the final language.